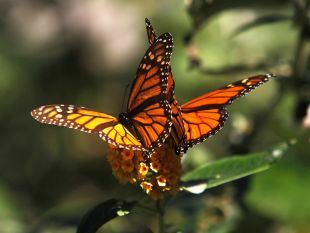 They say a butterfly flapping its wings in China can cause a hurricane in the U.S. weeks later. That's a tenet of chaos theory. What that pretty image means is that a very small change in initial conditions can create an enormously different outcome. Now a new study published in Nature Climate Change warns that intensifying river flooding in China caused by climate change is likely to have serious effects on the American economy. That's just one example of how a local catastrophe can have a global ripple effect in today's interconnected world, and global warming is expected to bring more and more local catastrophes. There is consensus that anthropogenic climate change is happening. There is no consensus on how bad it will get. Nor can we predict, given the vast number of parameters, what the Earth will be like in 100 years, or how climate change will influence human life and civilization. But before butterflies go extinct because of heat passing survivable levels, if it does, some effects are already happening and some can be predicted. One is intensifying weather extremes, hampering regional production. In general, flooding in the superpowers won't just hurt local manufacturers but the whole global network of trade and supply chains. 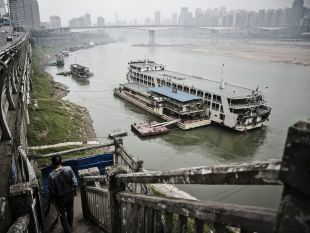 In the case of China, a particular casualty of the predicted 80% increase in river flooding over the next 20 years is expected to be the United States, predict Sven N. Willner and colleagues of the Potsdam Institute for Climate Impact Research. Why? Because despite U.S. President Donald Trump's threats of a trade war with China, and the U.S. is (still) running a tremendous trade deficit with the Asian giant. It depends on Chinese mega-factories and goods and cannot just supply its needs for the same prices from other sources. China in turns depends on its rivers for transport. Even the Chinese themselves have, after years of denial, admitted that climate change isn't a hoax by the west trying to dishearten the tigers of the east (funny, Trump thought it was a Chinese hoax), the Economist reported in a recent review. Not only has Beijing vowed to crack down on climate changing emissions. It's even contemplating taking the world lead in saving the planet, as the U.S. reverses into denial and even Germany's green fades, as attested by the imminent collapse of wind farms as 20-year subsidies expire. Meanwhile, until Chinese or other efforts bear fruit, Willner and colleagues warn that America is specifically vulnerable to flooding in China due to their unbalanced trade relationship. They suggest Trump might consider forgoing his dream of tariff sanctions and a more balanced trade relationship with the Dragon, not for some gauzy general good but to mitigate American economic losses. "Climate change will increase flood risks already in the next two decades - and this is not only a problem for millions of people but also for economies worldwide," said Anders Levermann, project leader from the Potsdam Institute for Climate Impact Research in Germany and Columbia University. Worldwide, they calculate that unless climate change is curbed, which hasn’t been happening yet, economic losses worldwide due to river flooding will increase by more than 15 percent to more than $600 billion within the next 20 years. The paper combines two new lines of work: global risk assessment for natural hazards and network theory, to describe how local shocks can propagate in time and space, explains World Bank economist Stéphane Hallegatte (who was not involved in the study). In this world, risk management is more than each country's responsibility, Hallegatte stresses: "It has become a global public good." China was singled out in the study because it is expected to suffer the biggest direct economic losses from river flooding: the economists calculate losses passing $380 billion in the next 20 years, about half of which is expected to arise from "normal" flooding - unrelated to global warming. That is a cool 5 percent of Chinese annual economic output. And that doesn't factor in economic losses from other horrors of the weather, such as heat waves, cold snaps and hailstones the size of goose eggs. Both the U.S. and European Union will suffer if Chinese exports collapse, but the researchers point out that the EU and China have an even trade balance, for the time being. As an ironic aside, rapidly developing India is expected to be the worst source of climate-changing emissions in the future. But it could pick up business opportunities from water-soaked China. And for a final note, again, all these scenarios are based on emissions so far. But emissions are expected to increase yet more, explains Christian Otto. "Our study rather underestimates than overestimates the production losses," co-author Christian Otto from the Potsdam Institute and Columbia University, adding: "Things could eventually turn out to be worse."